A state investigation found that the lapse covered a period that included the biggest spike in permit applications in Florida history. For more than a year, the state of Florida failed to conduct national background checks on tens of thousands of applications for concealed weapons permits, potentially allowing drug addicts or people with a mental illness to carry firearms in public. 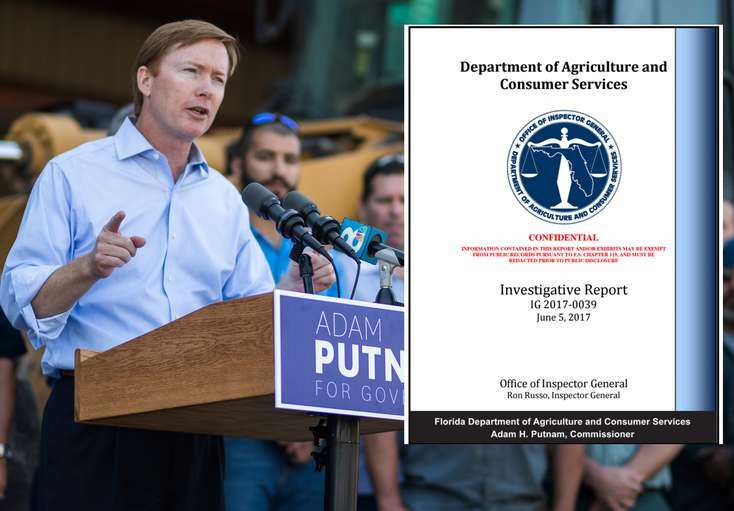 A previously unreported Office of Inspector General investigationfound that in February 2016 the Florida Department of Agriculture and Consumer Services stopped using a FBI crime database called the National Instant Criminal Background Check System that ensures applicants who want to carry a gun do not have a disqualifying history in other states. During that time, which coincided with the June 12, 2016 shooting at Pulse nightclub that left 50 dead, the state saw an unprecedented spike in applications for concealed weapons permits. There were 134,000 requests for permits in the fiscal year ending in June 2015. The next 12 months broke a record, 245,000 applications, which was topped again in 2017 when the department received 275,000 applications. Department employees interviewed for the report called the NICS checks "extremely important." Concealed weapons licenses "may have been issued to potentially ineligible individuals." If it came out they weren't conducted, "this could cause an embarrassment to the agency," the report said. ^^^ Couldn't log in? Seriously? The 49-year-old Hawthorne man contacted the sheriff’s office Tuesday, believing the drugs he bought were flakka instead of the meth he intended to buy. His reaction last week was different from when he smoked meth before, he told detectives. A Hawthorne man took methamphetamine to the Putnam County Sheriff’s Office on Tuesday thinking he was sold the wrong narcotic. Douglas Peter Kelly, 49, bought drugs last week from his ex-girlfriend and had a “violent reaction” with a racing heart after smoking them, according to the sheriff’s office offense report. 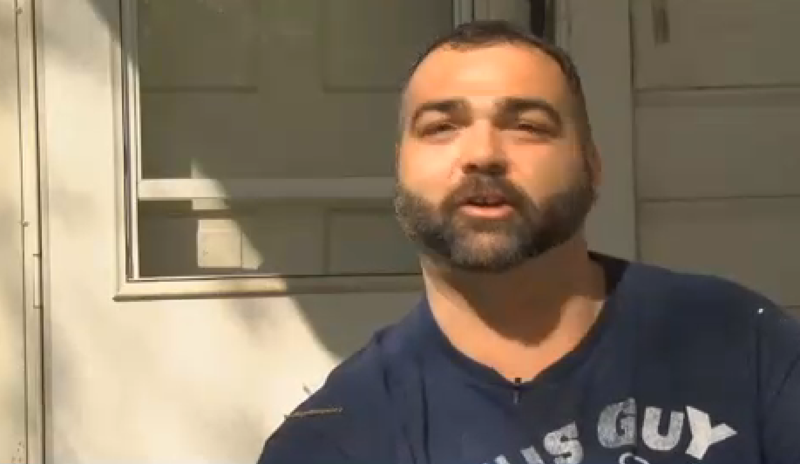 He contacted the sheriff’s office Tuesday, believing the drugs he bought were flakka instead of the meth he intended to buy. His reaction last week was different from when he smoked meth before, he told detectives. Flakka is a synthetic street drug with an intense high similar to cocaine’s. Kelly spoke with the sheriff’s narcotics unit and drove to the agency’s criminal investigations unit voluntarily to have the drugs tested. The clear, crystal-like substance he brought wrapped in aluminum foil tested positive for methamphetamine. Kelly was charged with possession of methamphetamine without a prescription. Can you imagine being so batshit insane that you say that crap,out loud,ON TV and mean it? An unusual child custody trial featured the couple speaking in tongues to a stuffed animal they said transmitted the word of God directly to them and refusing legal assistance because Jesus Christ — through the stuffed lion — was their lawyer, witness and judge. When interviewed by police about the allegations, she denied them. Her husband said that once, when he was frustrated with her and had had a few drinks, he put one hand over her throat and the other over her mouth. This led to a complaint to the Ministry of Children and Family Development. “The parents obviously love their child and wish to raise her in their home with their Christian values,” she wrote. “It is clear that there was sufficient evidence before the trial judge to allow him to come to the conclusion that a continuing custody order was warranted in the circumstances,” MacDonald wrote. She said the decision was not based on religious beliefs but on evidence of domestic violence; ignoring health care recommendations; concerns for the mother’s mental health; and their inability to work with those who could support them in parenting, including their own family, a maternity clinic, public health nurse, doctors, social workers, churches, Christian families and legal representatives. A continuing care order can lead to placing a child for adoption. 1] can you believe that the courts wont respect their religious beliefs? 2] how did god manage to LOSE a court case? One would expect him to be a better lawyer,eh? “Until I first drank my dog’s pee, I was depressed, I was sad, and I had really bad acne. Dog pee also has vitamin A in it, vitamin E in it, and it has 10 grams of calcium, and it’s also proven to help cure cancer,” says the woman in the video. Wayne Propst of Tyler, Texas, claims to have found the fossil of an animal that was onboard Noah’s Ark. “From Noah’s flood to my front yard. How much better can it get?” said Propst in an interview with CBS 19. After finding the fossil, Propst had it sent to self-proclaimed fossil expert Joe Taylor. Taylor is the director and curator of the evolution-denying Mt. Blanco Fossil Museum. The museum is infamous for thinking that everything in the fossil record is only a couple thousand years old. Taylor “confirmed” the fossil is from the time of the great flood. “I’ve never heard of anything about that from over there, I’m surprised he found it there,” Taylor said. After, their hopes were confirmed by Taylor, Propst and his family set to work on the front yard looking for more fossils and sending pictures to Taylor. Seeing as Propst is not a paleontologist, there’s a lot that can go wrong here. “To think that like he says that we have something in our yard that dated back to when God destroyed the earth. I mean, how much better could anything be?” Propst said. 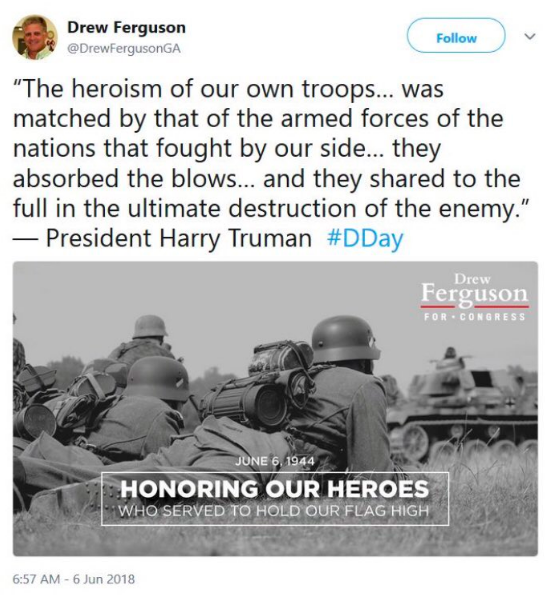 In a Twitter post commemorating the 74th anniversary of the D-Day invasion, Rep. Drew Ferguson (R-GA) tweeted, then deleted a photo of German troops. This Wednesday, the campaign Twitter account for Ferguson’s reelection campaign shared a black-and-white photo featuring WWII-era soldiers wearing the patented helmets of Hitler’s Waffen-SS infantry. In the background of the photo, a tank with the German iron cross could also be seen. Ferguso deleted the tweet and replaced it with a photo featuring U.S. soldiers from WWII, but not before Twitter users took screen shots. To be fair with a name like Ferguson he could have been on the side of the Nazi soldiers. She failed to mention the side effect - that it makes you look dog ugly. Wonder what extraction method she uses to get the urine?